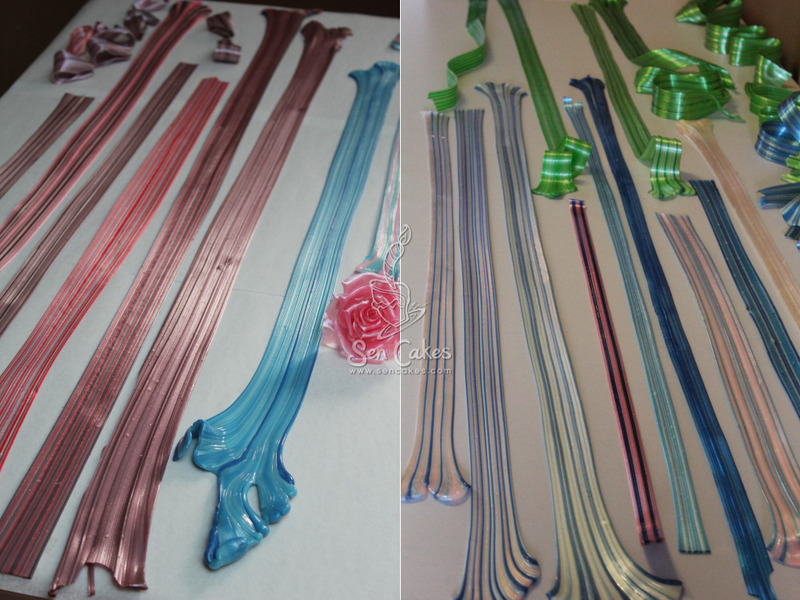 Recently, I made a goal to improve my sugar ribbon technique. 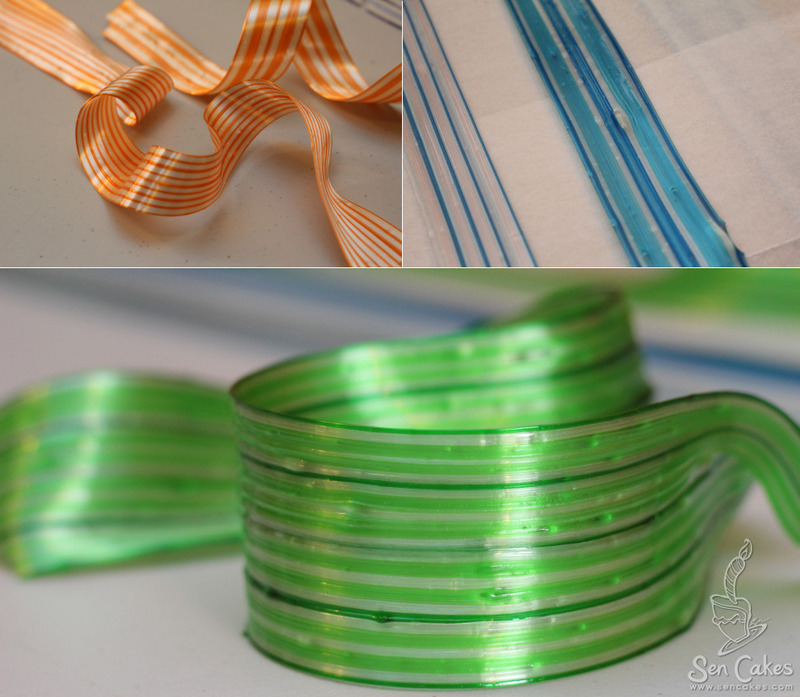 The goal was to create sugar ribbons with thin stripes, satiny shine, and minimal grains. 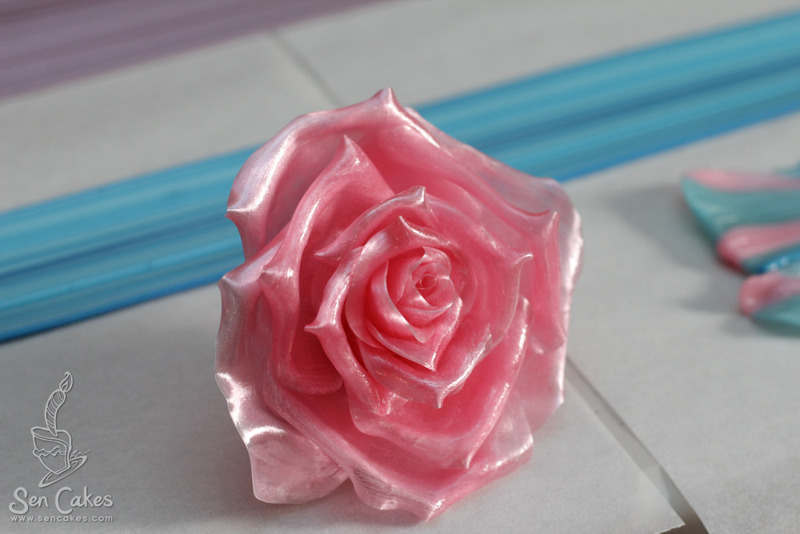 I wished to achieve this with sugar, not isomalt. Disclaimer: Proper equipment and safety is a requirement in working with boiling sugar. Temperatures easily exceed 300 degrees Fahrenheit and above, and the use of open flame & gas results in the risk of burns & fire. 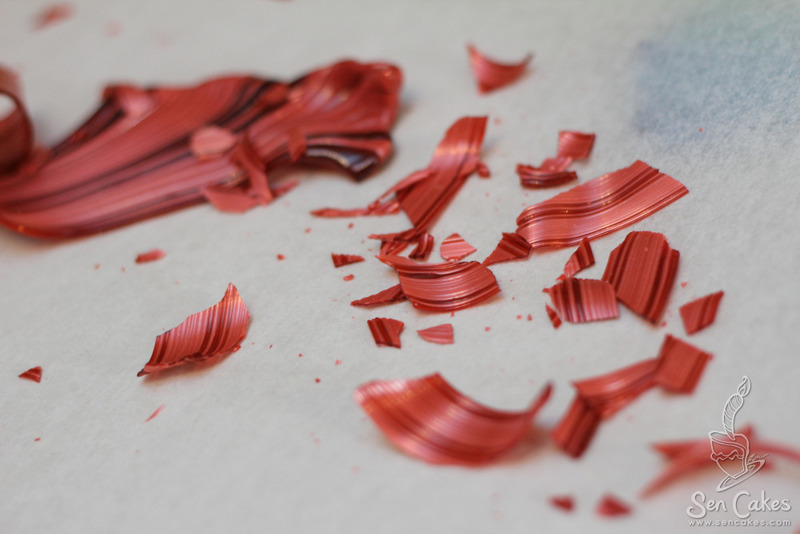 Shattered pieces are a common occurrence. Often there is no repair. Testing pulled sugar recipes. 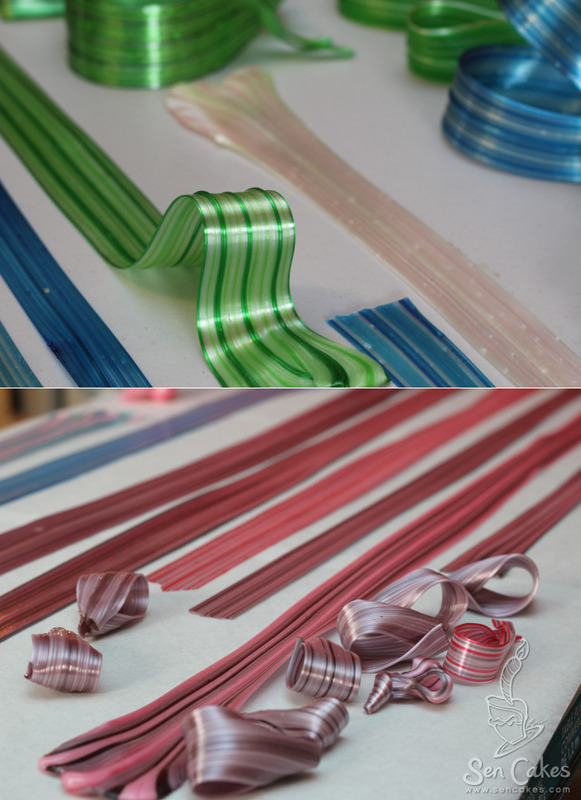 Each colour represents a new recipe. 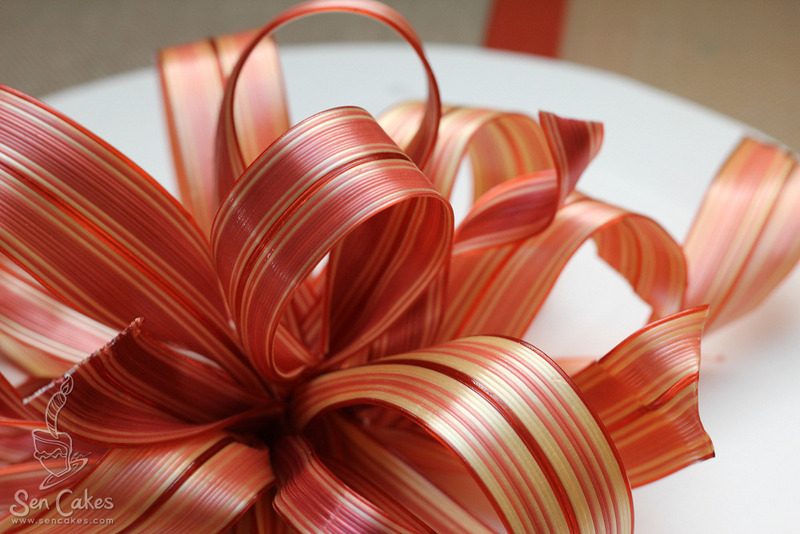 Interesting shapes created at the end where the ribbon is held and stretched. For a basic recipe as a starting point, see Professional Baking by Wayne Gisslen, now available online on Google Books. The basic recipe contains granulated sugar, glucose, and acid. I found similarities and patterns are found in ratios, batch weight, and temperature. I noted in the books, final boiling temperatures varied from 300F to 340F. My experiments resulted in inconsistent results in shorter vs. longer boiling time. Perhaps boiling time affects the time the sugar is exposed to the acid, thus softening the sugar as time is increased. On the other hand – longer boiling times also resulted in higher temperatures and less moisture, thus hardening the sugar. To summarize, acid inverts (also known as hydrolysis) sugar by acting as a catalyst, speeding up the split of sucrose (common granulated sugar), into glucose and fructose. Glucose also prevents crystallization, as noted in the article. The challenge for me was determining the cause of grains. In my trials, grains appeared immediately upon pulling the sugar, done shortly after boiling and cooling. This led me to believe the ingredients or recipes themselves were the factors. Batch upon batch resulted in grains. I tried to eliminate factors one by one. Frustration began to settle in and I really began to question. Were the textbooks fooling me? Were they leaving information out? Where the images photo shopped? 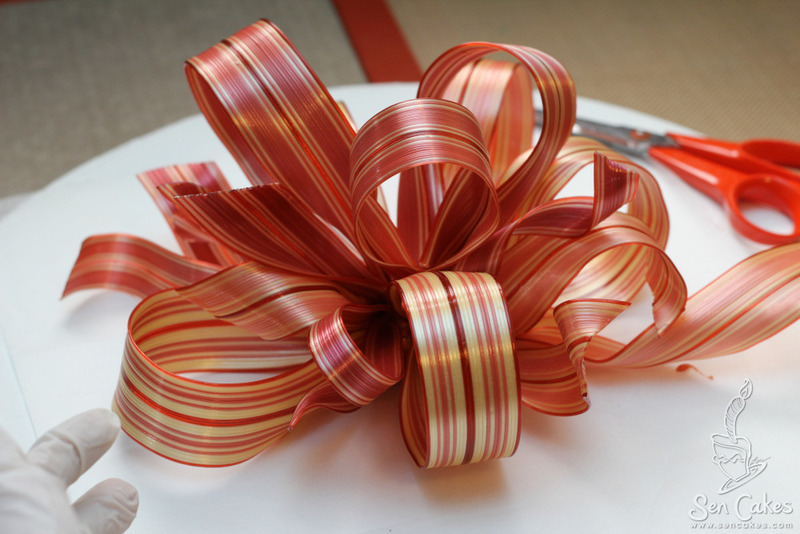 Did their cameras have filters and lenses that only focused on the grain-free portions of the ribbon? Was isomalt used? Was the purity of the sugar, glucose or water itself the issue? Troubleshooting grains in pulled sugar. 12 drops tartaric acid added at 275F: Sugar too soft and does not hold shape, however, fewer grains. (Top Photo:) Purple – acid added earlier, and then boiled to 320F. Fewer grains, but lost shape, worsening overnight. 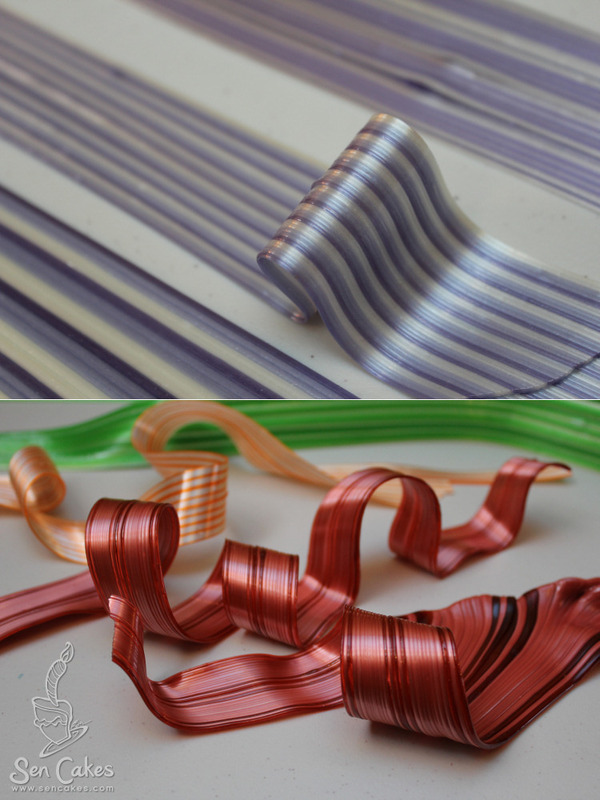 (Bottom Photo:) Orange – acid added later using the same recipe and temperature as purple ribbon. Increased grains, but shiner and held shape better. Burgundy- the grains are fewer, but the ability to hold shape is still not ideal. The lessons I learned – slight adjustments in acid, quantities, and temperature make a huge impact on final results. There is no one correct recipe. It is more practical to take a base recipe and adjust it accordingly. This is due to the numerous combined variables of time, temperature, quantities, environment, and ingredients. Higher temperature allows for a firmer sugar, counteracting the softening nature of the acid. It is important to boil the sugar until the correct consistency – to slow moving molten bubbles. The boiled sugar should not be fluid, but instead a honey-like viscosity. It is not only about reading the thermometer, but also visually reading the consistency of the sugar. 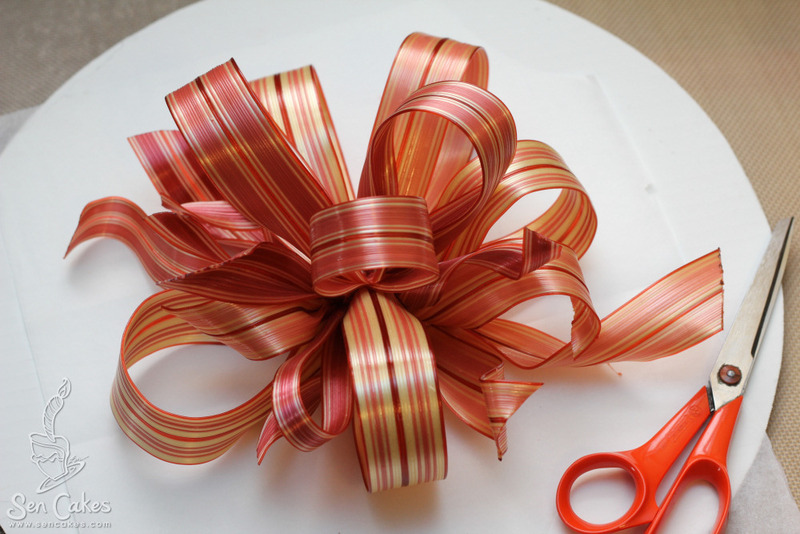 There are YouTube videos on pulling sugar ribbons, such as this one and this one. 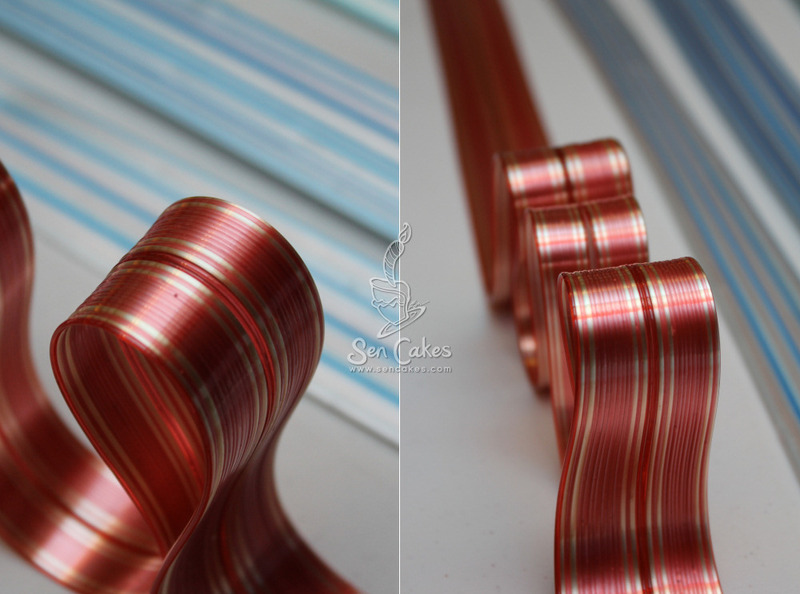 A sugar that is soft is easier to pull and form ribbons, but will not hold shape, absorb moisture easily, and lose shine quickly. 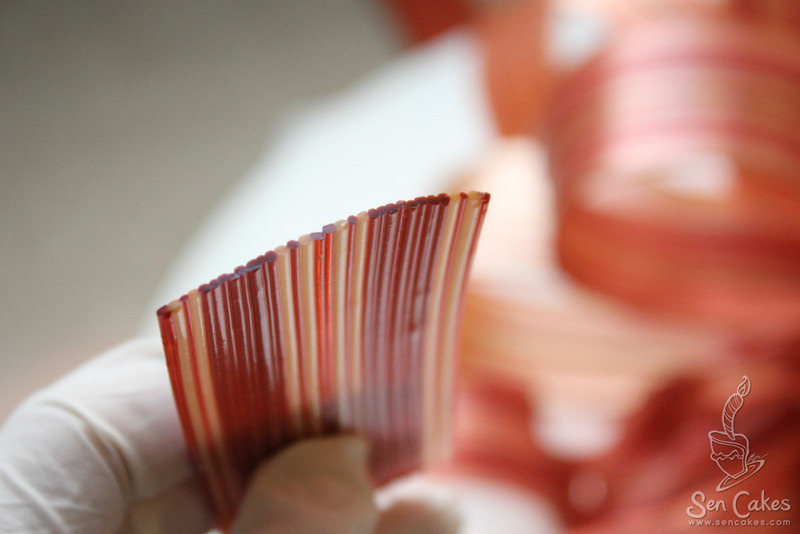 The ribbon sets shape quickly without the addition of cool air (depending on thickness). 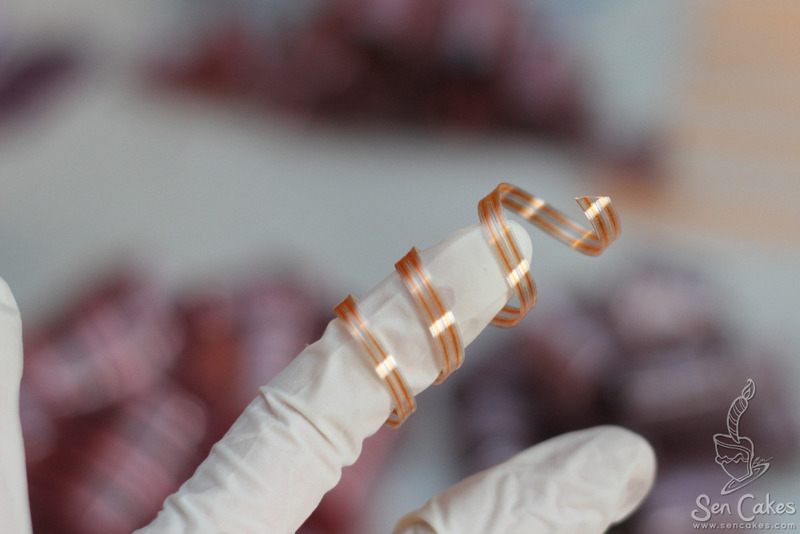 The ribbon holds shape overnight, without deforming. 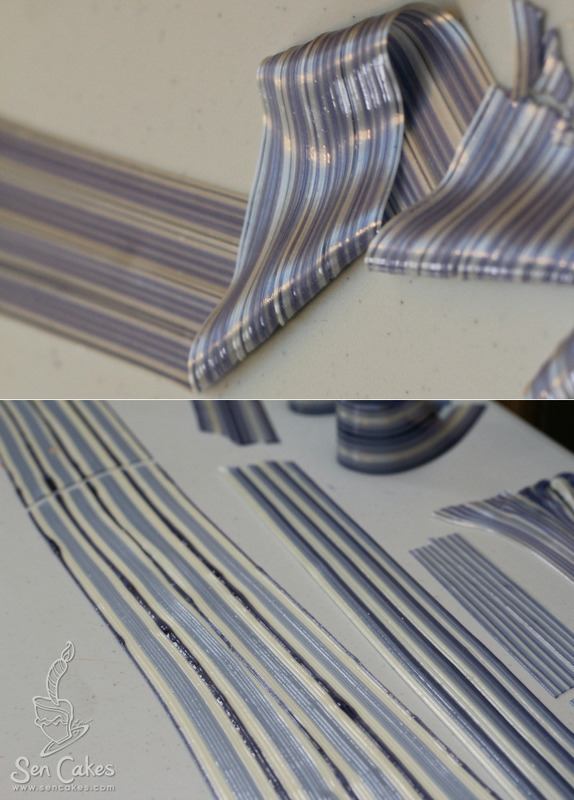 When shaping, start with a minimum of 6 strands, and up to 10. I find 8 is ideal. 8 doubled up twice results in a ribbon with 32 strands. 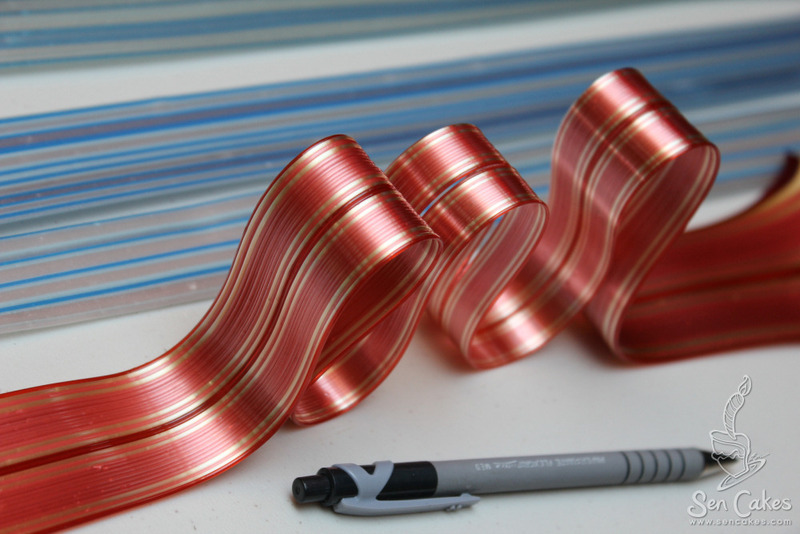 A finished 64-plus strand ribbon is possible, but may require a set of two hands because of the width. Start with strands even in size, shape and weight. Aerate just before forming strands. There are unlimited possibilities in pulled sugar. For inspiration, check out Stéphane Klein, one of the greatest masters of sugar art of our time (warning: some images NSFW). Rose, you are very special cake decorator that is all of what your goal is to be: a persosn who shares knowledge, happiness and harmony. We all have a great deal to learn from you. Thank you for sharing and creating happiness and harmony. Awesome job, if I can only too that. Good for you for doing so many trials! The results are beautiful! Amazing, Rose! You have infinite patience! 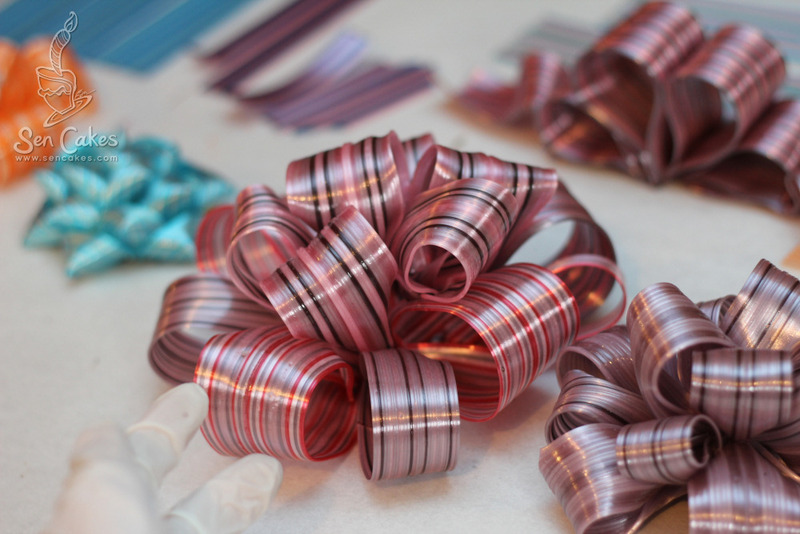 The ribbons are so beautiful! The rose is also stunning! Really amazing. Thank you for sharing your amazing talent!!!! I love this I want learn this but how? OMG, I can’t believe you did made ribbon out of SUGAR!! Looks AMAZING!!! Hello Carlisha, thank you for your question. I do most of my own photography. What type of camera and lens do u use? 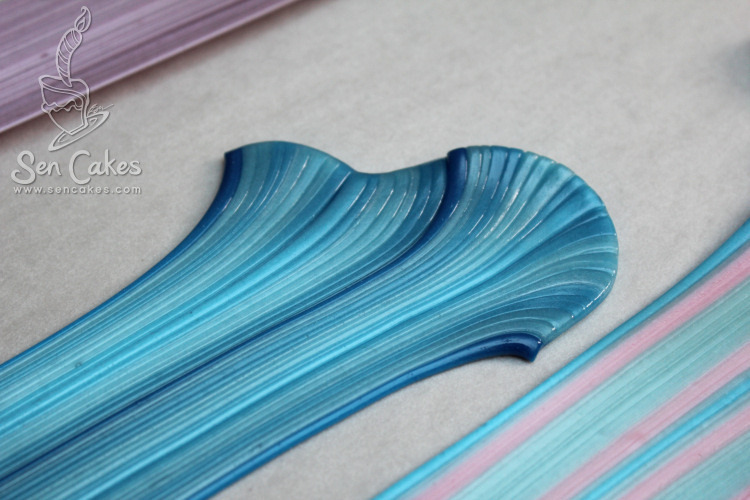 if you use an invert sugar it will eliminate many of your inconsistencies, like isomalt sugar. that is the most commonly used in the commercial French pastry kitchens. it should be available at specialty baking stores or can be ordered from most dry good/specialty purveyors.